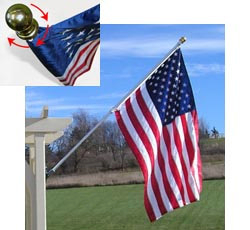 Flagpole House Set with Fixed Bracket,Heavy Duty Flag SetThis beautiful, high quality flag set offers a pole that "spins freely" on a set of ball bearings, virtually assuring that the flag will always be displayed properly. Flag set includes: 6' white aluminum 2-piece pole with gold ball ornament, a white cast aluminum mounting bracket and E-Z flag mounting rings. This set is available with or without US flag.